Bulgaria achieved an incredible success with its sovereign bond issue, which proves the world have trust in the current government and its economic policy, the prime minister has boasted. "Some of the biggest German, English, Swiss and Singaporean banks, Korean funds and many others rushed to the bond sale the moment it was opened, wanting to buy EUR 6.5 B worth of bonds," Boyko Borisov told the ministers from his cabinet at their meeting this week. He stressed that the sale was oversubscribed, while the yield achieved - considerably lower than the country's foray into international capital markets back in 2002. "Thanks to our decision to go to the markets at this particular moment, the next government will have no worries. Otherwise we might have had to dip into the budget and allocate nearly BGN 2 B to pay the debt. Would you be happy if I take BGN 2 B from the budgets of your departments?" 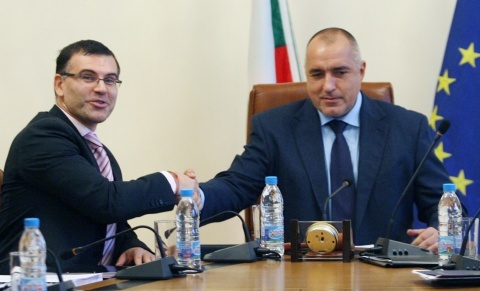 Borisov asked the ministers rhetorically in the down-to earth language he is known for best. Analysts have also praised the government for successfully issuing its five-year sovereign eurobond and on better terms than in 2002. The Balkan country sold EUR 950 M worth of five-year government bonds at an interest rate of below 5%, lower than the 7.5% for an issue that matures in January 2013. "Bulgaria's bond issue is a success because of the low interest rate and high number of investors, because it was oversubscribed and because it was successfully marketed in all regions - from Europe to Asia," Georgi Angelov, senior economist with the Open Society Institute Sofia, commented. "This demand for bonds is proof of the strong credit standing enjoyed by Bulgaria and the confidence given by the international markets for its financial sector," Dessislava Nikolova from the Institute for Market Economics, a Sofia-based think-tank, added. Analysts have also commented that the timing for the eurobond was right as it seized sudden improvement in market sentiment following last week's European Union summit to tap investors.